No word yet on when the restaurant will be opening. 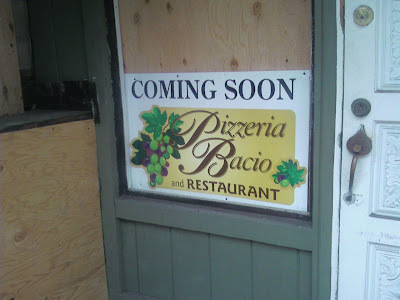 Random inside scoop: According to the Town Board Meeting minutes, Pizzeria Bacio received its liquor license on April 2nd. Oh man this is sad. Another pizzeria that will be out of business by next year. That location is cursed or something. God, quit it with the pizza places. i will only go to this place if they make me macaroni and cheese or chicken parm at 2:00 in the morning and/or hit on me while wearing a disgusting sweat-stained wifebeater.